Summertime slot machine is a 5 reel, 9 payline game from Microgaming that has a colourful, summer theme. In the full Summertime slot review below you can discover all about the mobile slot and its huge max jackpot of 10,000x per line and its one bonus feature. The bonus feature is a free spins bonus, which if you are lucky enough to hit, offers up to 15 free spins and a 3x multiplier making the game well worth a play. With the weather in the northern hemisphere getting colder and darker by the day, why not escape to an altogether more pleasant climate in Microgaming’s appropriately named Summertime slot? A simple five-reel, nine-payline game, for all intents and purposes Summertime is a classic fruit machine given a new lick of paint. 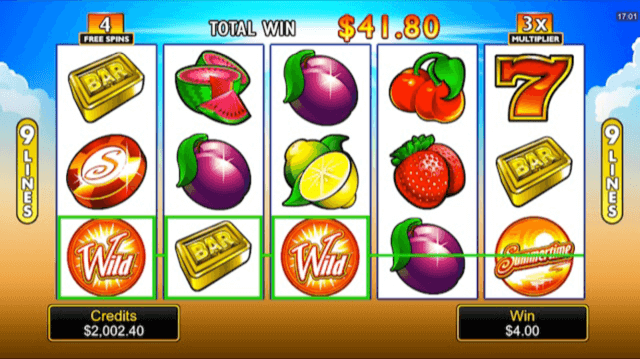 The symbols to feature on the reels include a range of delicious-looking fruit, lucky sevens, liberty bells, BAR symbols and the game’s logo, with the beach scatter symbol helping to initiate the slot’s sole bonus feature when three or more appear in a single spin. Playable from as little as £0.09 per spin with all paylines enabled, the Summertime slot machine can be enjoyed across all desktop, mobile and tablet devices and boasts a deceptively huge base game jackpot of 10,000x players’ bet per line. This large figure aside, the game is a pretty conventional title that won’t leave players scratching their heads over any of its features, meaning it’s an absolute doddle to get started. As explained above, Summertime boasts just one additional bonus feature and it’s a fairly standard one that should be familiar to all fans of classic mobile slots. Activated whenever players land the beach scatter symbol on at least three reel spaces at the end of a spin, they’ll get to enjoy 15 bonus games with the added benefit of a 3x multiplier to boost the value of any payline wins they happen to hit. At the end of this feature – or, indeed, at the end of a regular base game spin – players can also elect to gamble their winnings in a simple card picking game. Here, they’ll be able to double or quadruple their win by picking the correct colour or suit of a card respectively, but should they make an incorrect guess, they’ll forfeit their win in its entirety – meaning it comes with a fair deal of risk attached too. Aside from these two aspects, there’s not an awful lot else that you need to know about Summertime. The slot is a fairly basic offering that can be enjoyed by even the most inexperienced casino players. The Summertime slot is definitely not going to change the way that we view video slots, but it is nevertheless an enjoyable if fairly rudimentary title. The inclusion of a bumper 10,000x jackpot elevates the game above standard fruit machine fair, making it well worth a spin if you enjoy simple and rewarding microgaming slots. Like the Summertime slot review? Check out these as well…..